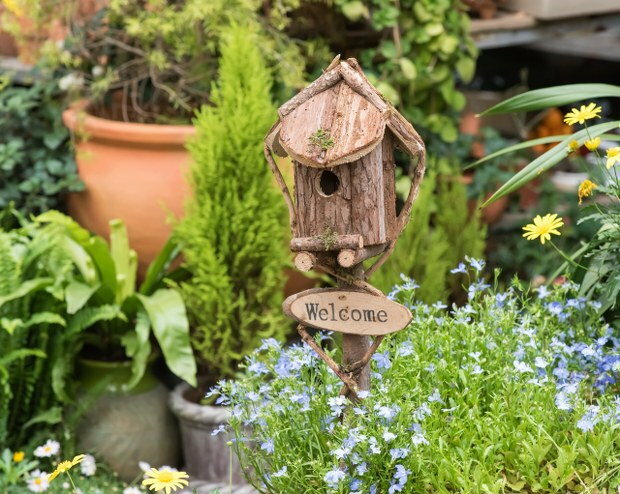 If you are an eco-friendly enthusiast, you likely enjoy your time in the garden. One great feature to add there or anywhere else really is a birdhouse. Your children will love the idea! 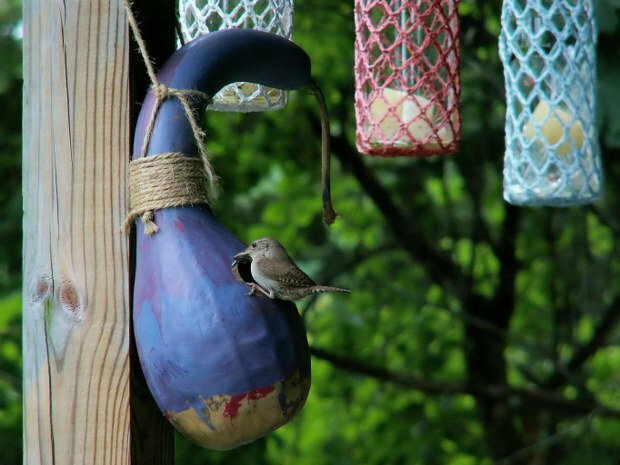 There is nothing quite like making your backyard a more pleasant place thanks to the beauty and songs of birds. 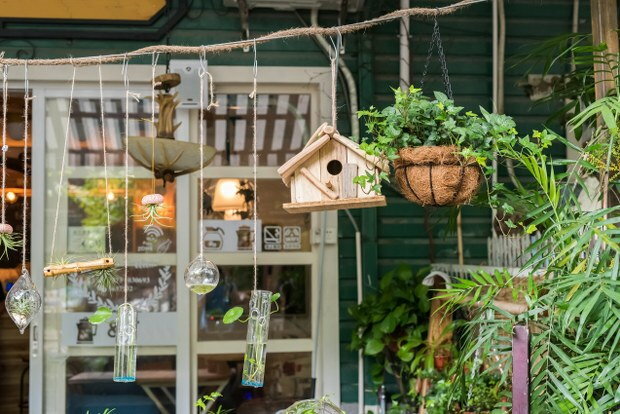 - Build one from recycled wood - instead of discarding wood and timber pieces to your rubbish removal pile, you can use them to create a birdhouse of a decent size. That is a great material to use for the job, as it naturally fits in any backyard and is considered most convenient for nesting birds. Start off by cutting two 1x6 lumber pieces. Cut and connect them, then attach a back panel. Glue it at the back edge of the two pieces and then attach a rooftop of the birdhouse in the same manner. If you think the birdhouse is a little shaky, you can add some L-brackets and use them to strengthen the walls. Mind you, the screws should not be too long. Next, drill an opening for the birds to fly in, as well as a perch hole where a 3-inch-long dowel should be inserted. Add this final panel with the opening and hang your birdhouse somewhere suitable. Use hanging points for this task. Now all you have to do is decide what colour you want to pain it. Remember that wild birds prefer muted colours better than bright ones. Now enjoy your brand new birdhouse made entirely from recycled wood from the waste removal pile. 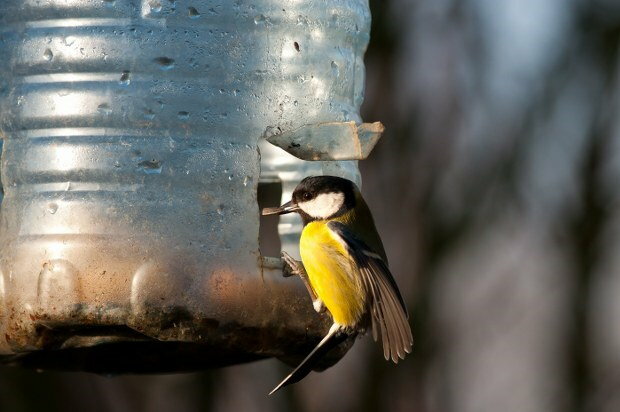 - Build one from discarded plastic bottles - what you need for such a birdhouse are two plastic bottles - 1 litre and 2 litres respectively. You can easily get those from the waste disposal pile you prepare in your home, as you likely use plastic a lot. Clean them well and cut them both in half at the widest part. Cut an opening in the smaller bottle, an inch from the bottom. Take the cap part of the other bottle and test fit to see if it blocks the opening. If everything is ok, add two hanging holes and tread wire through to hold them together. Make 4 holes in the cap, as those are needed for air circulation. Now all you have to do is paint the box and hang it wherever you want. Next thing you know, you will have a family of birds nestled in. - Build one from a gourd - garden waste is still a good source of material for building a birdhouse. Gourds make an excellent choice, if you pick one that is actually cured - solid and dried. Only then can you make a birdhouse from garden waste disposal material. The first thing you have to do is drill an entrance hole large enough to accommodate a bird. This can be a bit tricky, as too large a hole can make the birds vulnerable, while one too small will make it impossible for them to enter. On average, you want a 3.5cm wide and 15cm high hole. Clean out the interior of the gourd and drill a small hole to hang it. You will need a few more drainage holes and a perch hole near the opening as well. Sand the outside and paint it in your preferred colour. It is wise to seal it with a coat of polyurethane or varnish. All of these birdhouses are made from materials you’d expect to find on the rubbish disposal pile. That makes them an eco-friendly option, which any bird will love!